Application Support: CrossOver now supports Quicken 2018.
macOS: Several macOS users have had serious problems using CrossOver with macOS 10.13, High Sierra. This update includes fixes which we hope will resolve High Sierra issues using CrossOver. Office 2016: We have fixed several issues related to signin and registration for Office 2016. Office 365 users should again be able to sign into Office 2016 and activate using their Office 365 credentials. Next story DaVinci Resolve Studio 14.3 – Professional color correction. Previous story Blocs 2.5.0 – Visual web-design tool. CrossOver 13.0 – Run Windows apps on your Intel Mac. 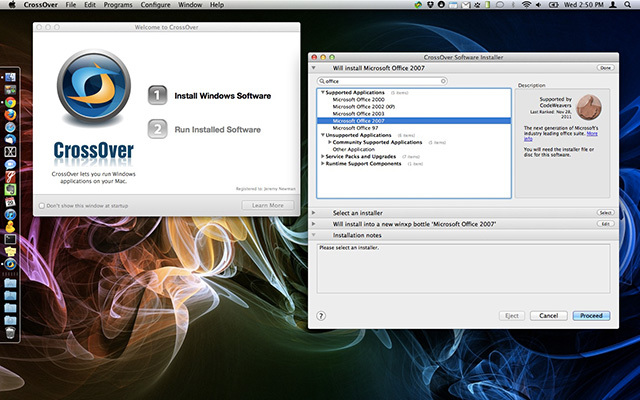 VirtualBox 5.0.22 – x86 virtualization software.